Joe Fortes Seafood & Chop House chef Wayne Sych believes in cooking with sustainable seafood. Chef Wayne Sych is no stranger to seafood, or the challenges that come with perfecting it in the kitchen. Having spent the last 17 years at some of Vancouver’s best-known seafood establishments, Sych enjoys collaborating with staff to keep seasonal menus fresh. As the executive chef at Joe Fortes Seafood & Chop House, Sych works with his 70-plus kitchen staff to create dishes that they will eventually plate for hundreds of people a day—at capacity, the restaurant seats 250 patrons. Much of Sych’s early career was spent in restaurants in the Fraser Valley, where he still resides. It wasn’t until 1998 that Sych made the career move to a larger establishment in downtown Vancouver. 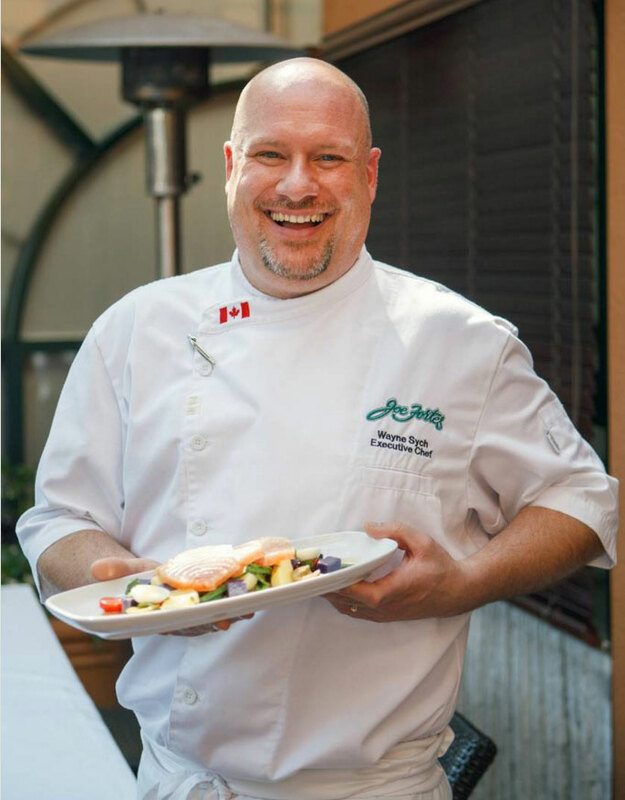 He spent eight years at the Fish House in Stanley Park, where he moved through the ranks, beginning as a sous-chef and eventually becoming the restaurant’s executive chef. Sych was the last executive chef at the iconic Cannery restaurant before it closed in 2010, and he’s been with Joe Fortes since early 2011. At home, he loves to play with ingredients like barnacles and he’ll often wander through fish markets when he travels. Since he believes in cooking with sustainable seafood, he was compelled to contribute to The Ocean Wise Cookbook 2: More Seafood Recipes That Are Good for the Planet (Whitecap). Editor Jane Mundy’s second Ocean Wise cookbook brings together 150 recipes from chefs across Canada detailing how to prepare everything from poached sablefish to Dungeness-crab ravioli to hot-smoked salmon. The book includes Sych’s versatile albacore tuna niçoise salad, below. He suggests pairing it with an unoaked Chardonnay or Sauvignon Blanc. When purchasing albacore tuna, ask your fishmonger for a sashimi-grade frozen tuna loin. The tuna for this dish is served raw. If you prefer the tuna to be cooked, sear the loin whole in a hot pan on all sides until rare. Cool and then slice. Tuna is best served rare. This salad is great on its own without the tuna or as a side dish with any meal. Mix the lemon juice, red wine vinegar, honey, mustard, and garlic. Whisk the olive oil in a slow, steady stream into the vinegar mixture until incorporated. Season with salt and pepper, and set aside. In a large pot of boiling, salted water, blanch green beans until al dente (about 30 to 40 seconds). Remove with a slotted spoon and chill in ice water. Add the yellow and purple potatoes to the boiling water and cook just until slightly tender, about 4 to 5 minutes. Remove with a slotted spoon and let cool on absorbent towels at room temperature. Do not cool the potatoes in water, as they will become waterlogged. Do not overcook the potatoes, as they will break apart and be mushy. Slice the raw tuna with a sharp knife while it’s still partially frozen and set it in the refrigerator to finish thawing. If the tuna is completely thawed, it becomes difficult to slice and will break apart. Place the green beans, cherry tomatoes, olives, potatoes, basil, and parsley in a mixing bowl. Toss with about half the dressing or until well coated. Assemble the salad on chilled plates. Lay the sliced tuna on top of the salad and place the hard-boiled eggs around. Drizzle the leftover dressing on the plates. Sprinkle the tuna with fleur de sel. Yield: 4 servings. Recipe has not been tested by the Georgia Straight. Adapted from The Ocean Wise Cookbook 2 (Whitecap, 2015), edited by Jane Mundy. Reprinted with permission. All rights reserved.